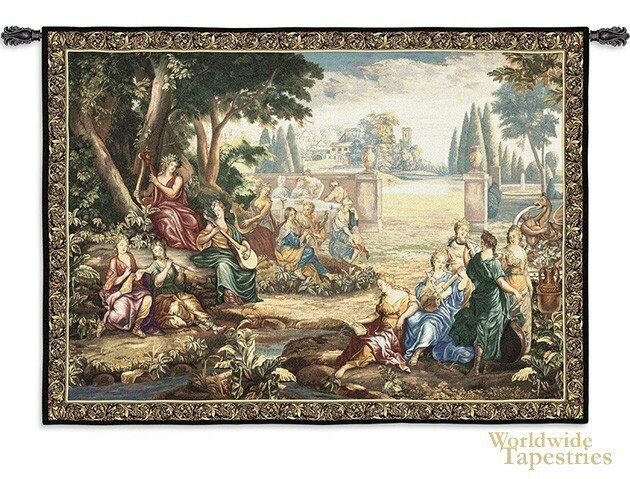 In this Harmony II tapestry we see a gathering of Apollo among the Muses on the mountainside on Heiicon. Based on the original design by Bernard van Orley (1487 - 1541), a Flemish Renaissance painter. this scene is one of six tapestries in the "Triumph of Apollo" series, which were originally woven in the workshops of Leyniers in the 18th century. Apollo is a god of light, truth, healing, music and poetry. Here we see Apollo and his muses playing the flute and harp and enjoying the day on the mountain side clearing. This mythical and classical setting reflects the popularity of this subject matter in 18th century art. This Harmony II tapestry is backed with lining and tunnel for easy hanging. Note: tapestry rod and tassels, where pictured, are purchased separately. Dimensions: W 71" x H 53"